So, who remembers me workingon a set of cushion covers? And who thought I’d forgotten all about them? My lovely pattern testers have been working on these for a little while, but everyone is now done, the errors are all ironed out, and the heatwave has broken so I have enough brain power to present to you the Sunset Cushions! Aren’t they bright and cheerful? There are three complementary designs. Each design shares the same centre and same colour order, but use post stitches to create different stitch patterns radiating out from the centre. As you might gather from the name, I was inspired by the colours of a particularly lovely sunset: the reds and oranges close to the horizon slowly transforming through yellows and pinks until finally they meet the darker blues of night creeping in. After the gloom and frustration of my last post, I have some good news to report 😀 no, not a new pattern design precisely, but a new project. Some creativity, at least. I have embarked on another freeform crochet project. This time a more functional item than The Starry Night: a cushion cover. To be more precise, a cover for my wheelchair cushion. As many of you know, I use a wheelchair most of the time when I’m out and about. It’s a nice wheelchair. Lightweight, easy to manoevre, very comfortable. And then there’s the cushion, which is dark grey and covered in vinyl. It’s boring. It’s dull. Okay, so I don’t actually see it a lot of the time (and neither does anybody else!) because I’m sitting on it, but hey, just because something isn’t seen much doesn’t mean it can’t be pretty, right? Being Cornish I absolutely have to do this one too!! 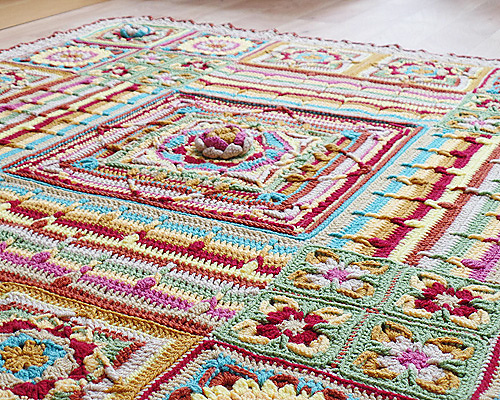 I would like to announce that I will be doing video tutorials for the Demelza blanket designed by Catherine Bligh. The blanket has been inspired by the character Demelza from Poldark, a series of novels written by Winston Graham in the 20th century and recently adapted for television by the BBC. The design is completed and is available in English and Dutch. You can jump right in and start making it or you can join me and a lovely group of ladies and make your Demelza blanket as part of a crochet along. I absolutely want to do this one! It is time to announce the start of a FABULOUS new crochet along: Ubuntu. Ubuntu is the new Scheepjes CAL and is designed by my dear friend Dedri Uys from Look At What I Made. Dedri has designed a fabulous blanket and I am going to help with the tricky bits by making English and Dutch video tutorials for you. Many of you have started with Stitch Story crochet along, and if you haven’t you still have loads of time to join in. Today we make part 2 which is a moss stitch square. The textured square is delicate and gives our blanket a subtle texture. Stitch Story is designed by Heather Gibbs from Keep Calm and Crochet on UK and I am here with a series of video tutorials to help you with the tricky bits just in case you need me. Week 26 and we return to some of our earlier rows in this blanket… we start with the lovely 3 rows which we’ve used throughout our blanket -this is the fourth time we have done these rows although the last time was in Week 13 so it’s about time they returned! And then we end the week with some Granny Stitches.